Your morning starts with fresh coffee or tea that you can enjoy on our patio, or dock, watching the many birds and animals that live by Picton Bay. Breakfast begins with OJ and home-made granola served with Greek yoghurt, fresh, local fruit and County honey. Breakfast main dishes range from caramel-baked French toast, apple-cinnamon or blueberry pancakes, County Potato Pie, omelettes or crepes. Bacon or sausages are served separately. 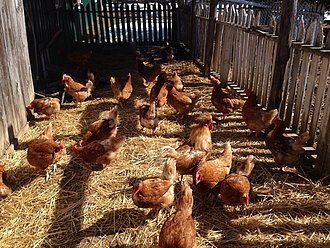 Our eggs come from happy hens that live at Maggie's Hobby Farm. You can see a photo of the 'girls' above. Espresso-based coffees are served with breakfast. Please let us know of any food allergies or issues when you make your reservation. This is a popular dish at Bay's End B&B. Mix together 1/2 cup honey, 1/2 cup canola oil and 1 tbsp. vanilla and add to oat mixture. Bake on a parchment paper lined baking sheet at 300 degrees F. until lightly browned. 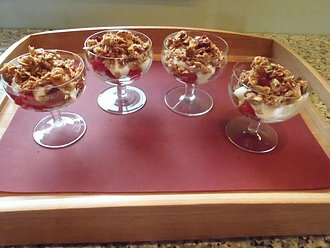 Assemble fresh berries in the bottom of a clear-glass bowl, then a layer of Greek yoghurt and top with granola. This can be topped with County honey. Enjoy! In a small saucepan, combine 1 cup brown sugar, 1/2 cup butter and 2 tbsp. corn syrup. Cook over medium heat, stirring constantly until thickened. Pour sauce into a 9x13 baking dish and sprinkle with 1/2 of the pecans. Place half of the bread on top (sliced or in pieces) and sprinkle the remaining pecans on top, then cover with remaining bread. Combine eggs, buttermilk, vanilla and spices and salt and pour over bread. Cover dish and refrigerate overnight. Let sit at room temperature for 30 minutes before baking at 350F for 40-45 minutes. 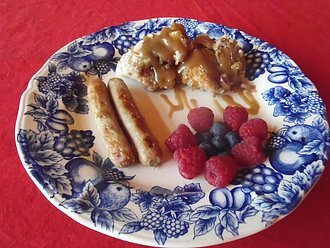 Serve with County maple syrup or caramel sauce. Sauce: combine 1/2 cup brown sugar, 1/4 cup unsalted butter and 1 tbsp. corn syrup in saucepan and cook until slightly thickened.